This entry was posted in Network on August 5, 2009 by Mel. Nbtstat is designed to help troubleshoot NetBIOS name resolution problems. 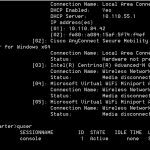 When a network is functioning normally, NetBIOS over TCP/IP (NetBT) resolves NetBIOS names to IP addresses. It does this through several options for NetBIOS name resolution, including local cache lookup, WINS server query, broadcast, LMHOSTS lookup, Hosts lookup, and DNS server query. The nbtstat – a < name > or nbtstat – a < IP address > command performs a NetBIOS adapter status command on the computer name specified by < name >. The nbtstat – c option shows the contents of the NetBIOS name cache, which contains NetBIOS name-to-IP address mappings. nbtstat -n displays the names that have been registered locally on the system by NetBIOS applications such as the server and redirector. This entry was posted in Network on January 21, 2009 by Mel.